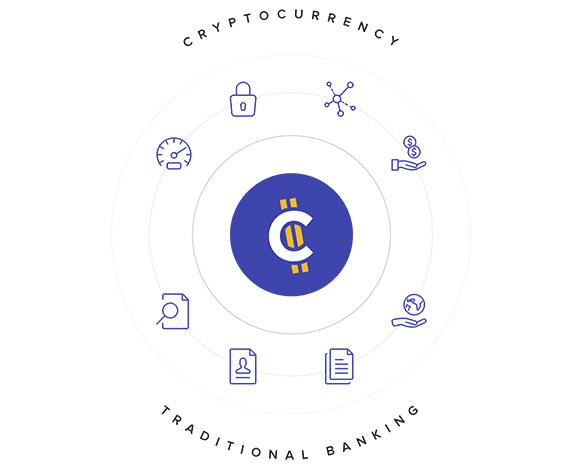 BitCash (BITC) is a new crypto project being described as a solution that combines the power of blockchain with the features of banking to create the world’s most usable cryptocurrency and one that is easy to be used by regular people. It combines the advantages of cryptocurrency (speed, privacy, decentralization, low fees) with traditional fiat banking systems (transaction records, account names, electronic statements, accounting software integration), making BitCash an interesting project to keep an eye on. Since you can also mine BITC, if you are looking for new interesting coins to mine that are new and still under the radar. then BitCash is once more interesting find. BitCash (BITC) uses the same proof of work mining algorithm as Merit (MRT) that we have recently talked about, however the Cuckoo cycle algorithm in BitCash is using an Edgebit value of 27 and not 26 like for Merit. As a result you need a specific miner for BitCash (BITC) and get lower hashrate due to the difference in parameters and the official Merit miner will not work, though there is a third-parity miner already available that supports both coins, but more for that in a minute. Although BitCash (BITC) uses the same mining algorithm as Merit (MRT), the general idea and the implementation of the project is quite different, so it is not just a simple fork. BitCash has a maximum coin supply of 100,000,000 BITC, the block time is 1 minute and block reward is 21.5 BITC in total, however there is a 9.7% premine and an ongoing 10% from the block reward going to the developers, so the actual block reward that goes to miners is 19.35 BITC per block. There is no proof of stake or growth score, so the coin can be pretty much only mined and traded, though there is no official or third-parity exchange supporting it for the moment (the project is still just a couple of days old and ecosystem development is still going on). If you are interested in buying or selling some BITC coins you can currently do so on the official Discord channel of the project. 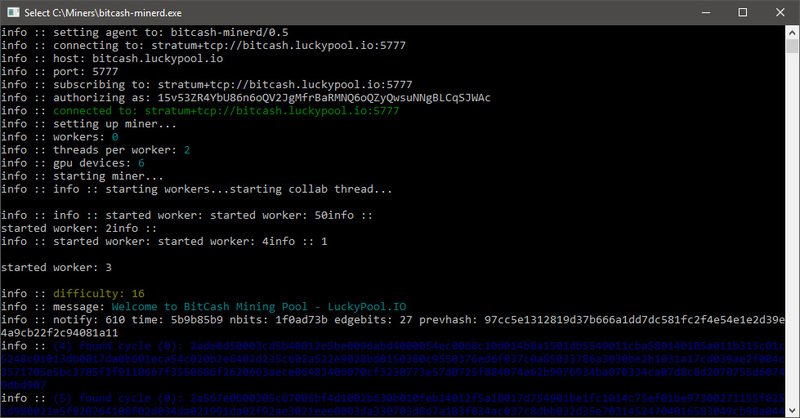 You can download the official bitcash-minerd.exe miner for Windows here, there is a version available for Linux in the form of Ubuntu 18.04 and Ubuntu 16.04. Do note that the miner requires an Nvidia GPU with at least 4GB of video memory and you need up to date video drivers installed with support for the latest CUDA versions. 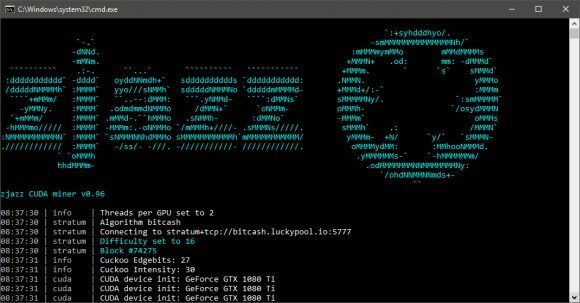 Today zjazz has released an update to his zjazz cuda miner for the Cuckoo cycle algorithm adding support for BitCash (BITC) along the already available Merit (MRT) support in the software. 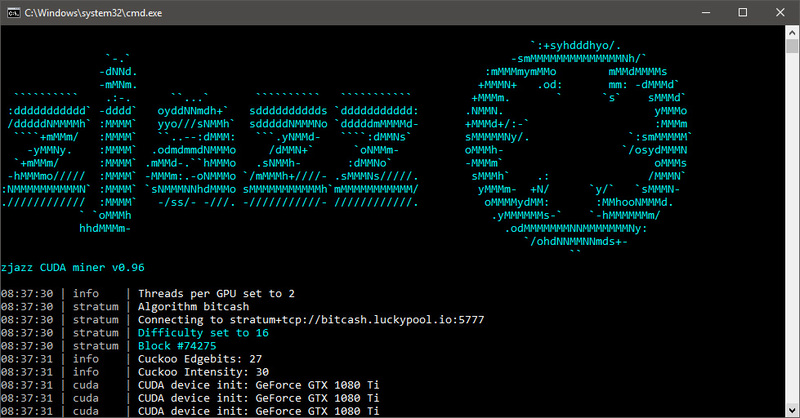 It is a closed source miner available with binaries for both Windows and Linux that offers more options to try and tweak performance on mining rigs with both slower or faster CPUs, though this comes at a cost of 2% developer fee. 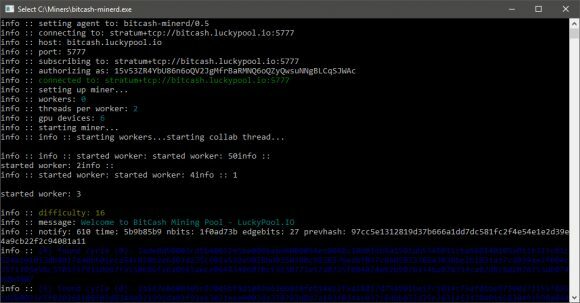 Do note that the miner is still an early version and work in progress and may have some issues, though it does seem to handle better than the official miner on systems with slower processors stability wise.